For centuries, stair railings have traditionally been made out of wood, (wrought) iron, steel, or any combination thereof. And while those materials are still very much in demand, and each have their own visual merits, lately another material has garnered a lot of attention. 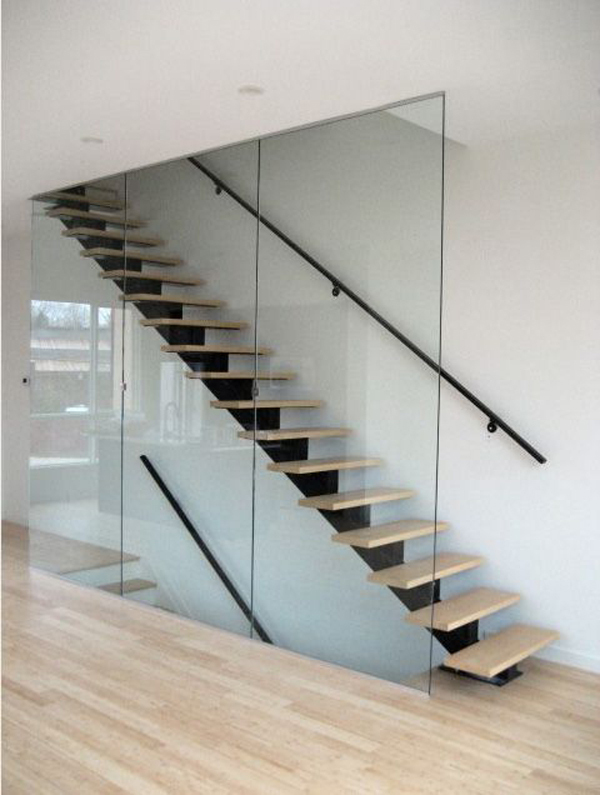 Glass stair railings have all the structural advantages that the traditional materials come with, but they create a completely different look than all other previous options. Where wood, iron, and steel draw the eye with their solidity and their individual designs, glass railings most notably impress with their seeming absence. Where the previous materials always are just there, glass manages to open up the room, make it seem bigger and airier with its inconspicuousness. Glass stair railings work particularly well in combination with clear, simple designs and beautifully emphasise the simplicity and cleanness of modernist designs. 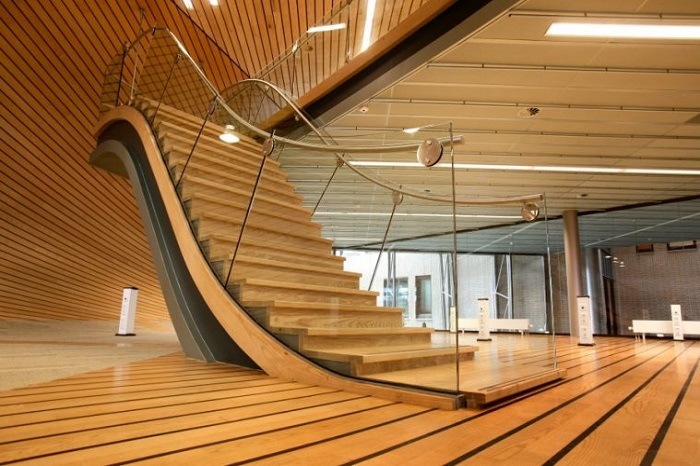 With the floor, stairs, and railing all made from the same wood, this staircase not only gives the impression of being part of a whole, but actually being a whole. This unique design takes the idea of seemingly floating stairs to the next level. The solid glass walls with no visible handrail add to the overall image and beautifully combine security and the weightlessness of the design. This daring stair design in the style of a lighting-rig or industrial strutting in a thing of beauty you want to spend hours looking at of itself. 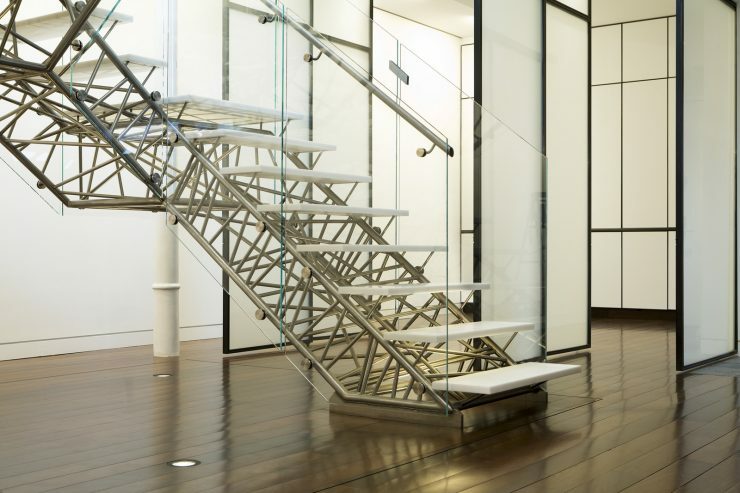 The restrained look of the near-invisible glass panels that make up the railing and the hardly noticeable handrail that picks up the construction’s style, gives the necessary safety of use without distracting from the stylish look of the stairs themselves. 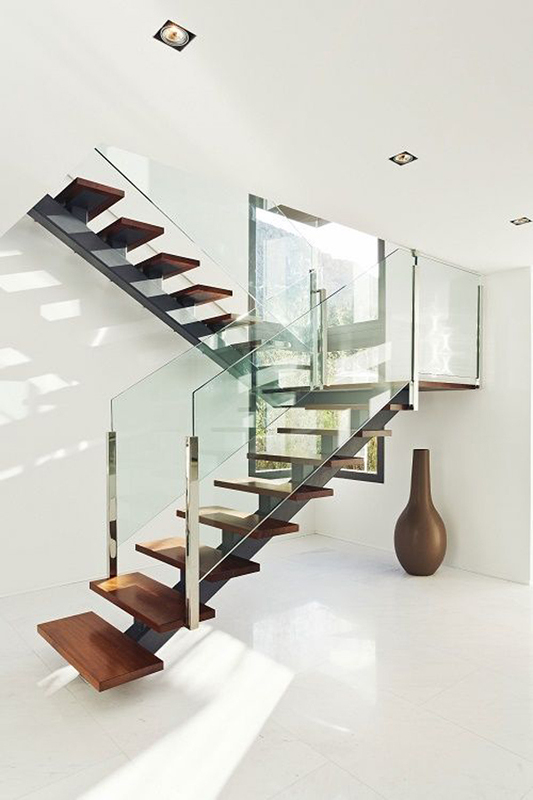 This is the perfect example for how a combination of glass stairs and railings blend in with the room to give the notion of lightness and space. While the stairs with the greenish tint are definitely there, they still appear nearly invisible in the overall scheme of things, but still manage to attract notice by seemingly floating in space. 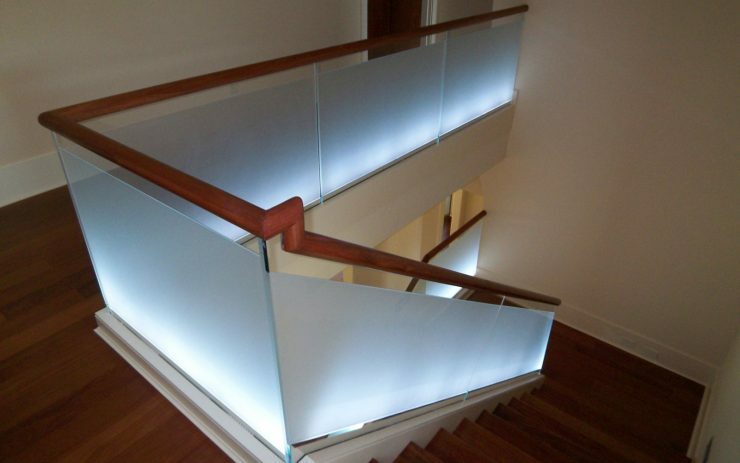 Play around with frosted glass panels and incorporated lights at the base of the the railing to create stunning designs that serve both as a stunning visual and as an indirect light-source in your stairwell/a muted nightlight. When your whole living-room is centred around a specific colour palette, its just logical to take up this colour-scheme in your stairs as well. 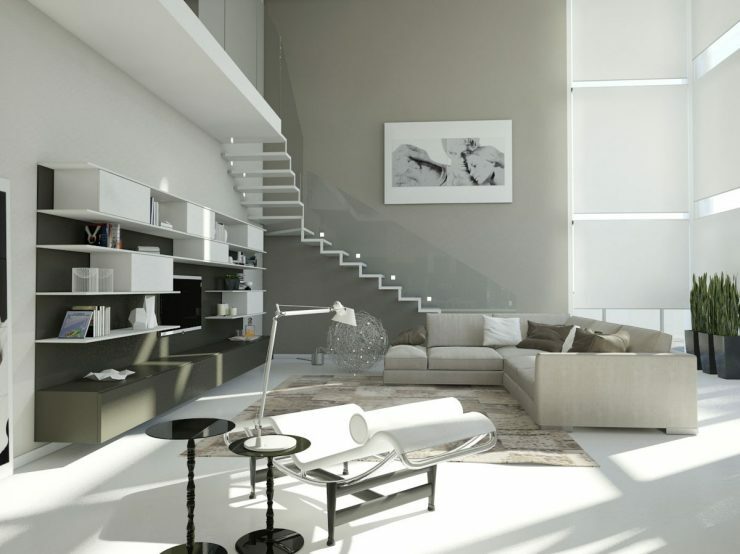 The grey wall-mounted floating stairs seamlessly blend in with the overall design and appear a logical part of the room instead of a means of reaching one floor from the other. 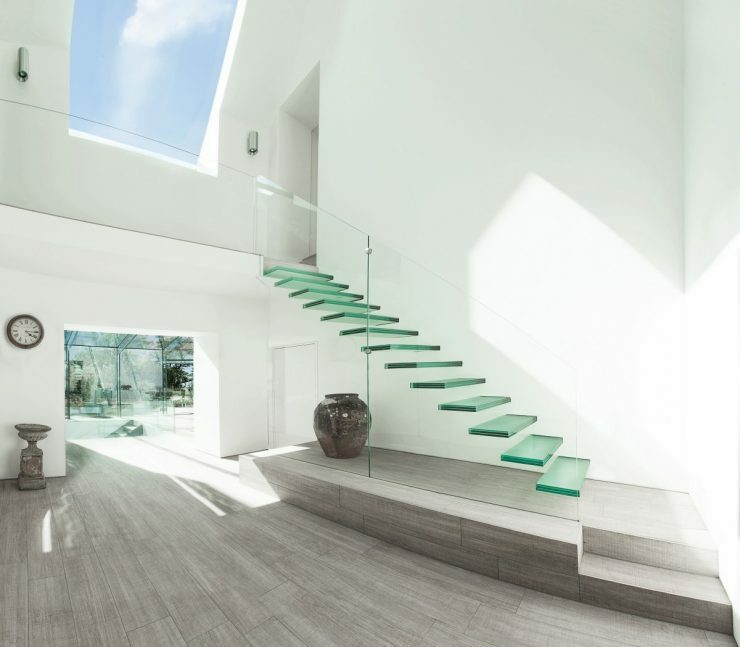 In combination with the predominantly white room-design and the white stairs, the glass panels used as stair railing appear to be virtually invisible. 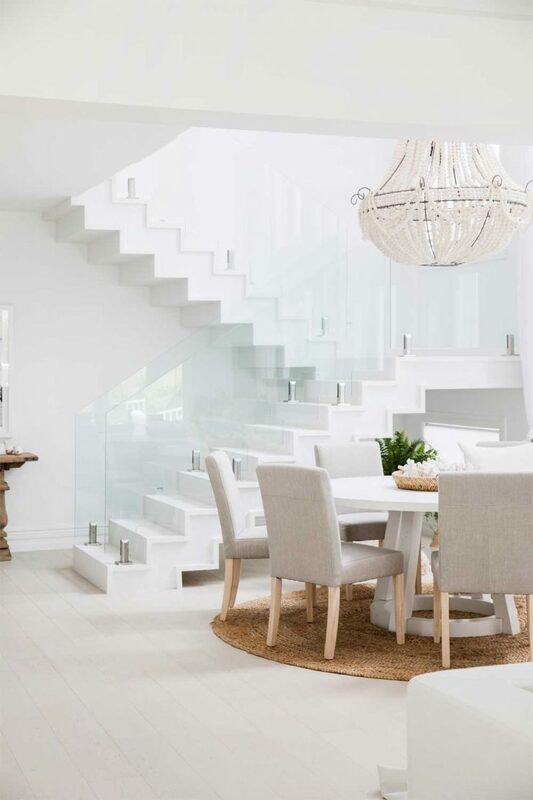 This stunning stair design enhances the feeling of lightness and airiness of the home and is a perfect example advocating for the use of glass stair railings. 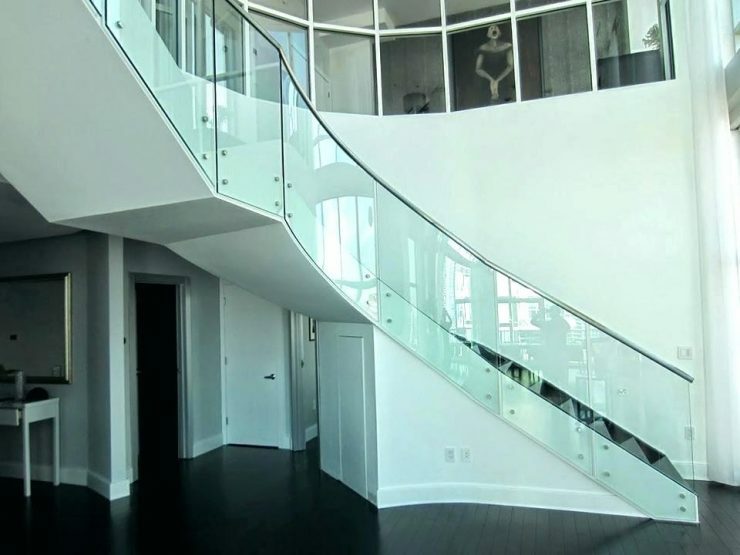 The extravagant curved stair and railing design gives this stairwell its unique contemporary look. The blueish glass panels blend in perfectly with the similarly off-white walls, and add another layer of modern chic to the room. A different take on the glass-panels-as-stair-railing idea is this unique solution that has floor-to-ceiling panels separating the staircase itself from the rest of the room without acting as a (visual) barrier and shrinking the room. 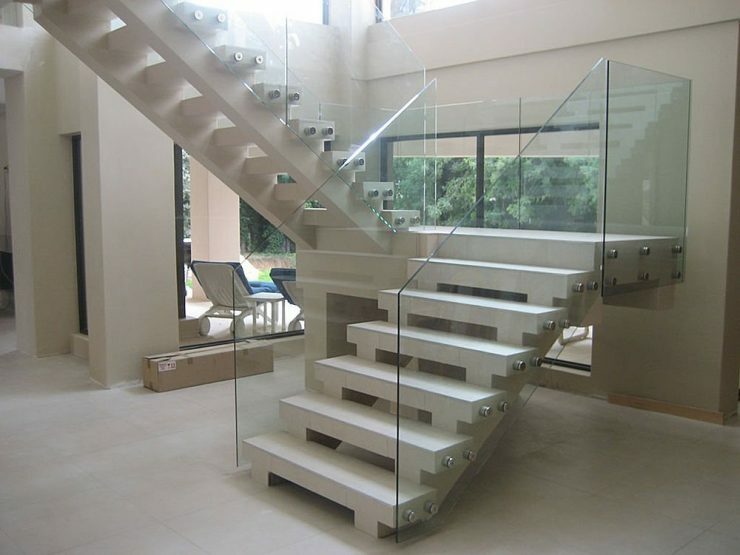 This unique stair design shows the absolute advantage of making use of glass railings. Where wooden (and to some extent metal) railings are rather restricted in the shapes they can be manufactured in, you can go all-out with glass panels. A stair shaped like a large wave? No problem. Glass panels easily accommodate even challenging forms that require the bottom of the panel to be much more curved than the gently undulating upper regions. Circular staircases can, at times, look rather dated, no matter how modern the room design around it might be. Utilising both glass steps and a curved glass railing with a subtle metal handrail transforms the otherwise rustic type of stairs into a veritable style wonder that looks beautifully modern and edgy at the same time. This no-frills, no-fuzz example of a very modern staircase shows off one of the main reasons to go with glass railings: it doesn’t take away from the clean look the designer intended. You still get all the safety aspects of a “regular” staircase without any of the visual disadvantages. 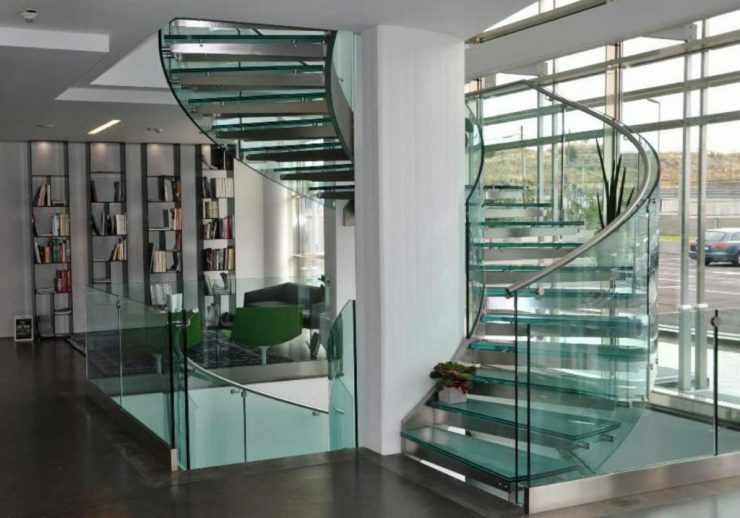 This beautiful staircase shows another advantage of (predominately) employing glass in your stairwell-design. 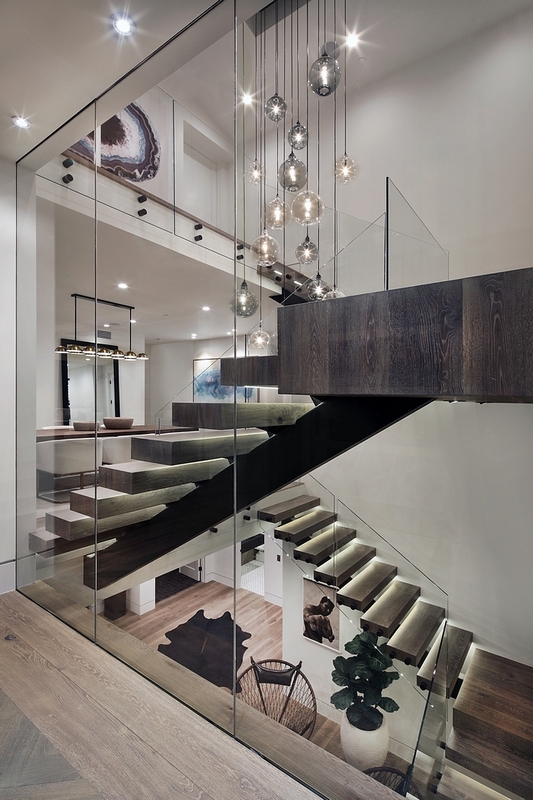 The glass walls separating the stairs from the actual living areas, as well as the glass railings on the stair itself open up an otherwise typically dark stairwell and make it a widely open, light and airy place that seamlessly fits into the overall home design instead of being a separate entity. 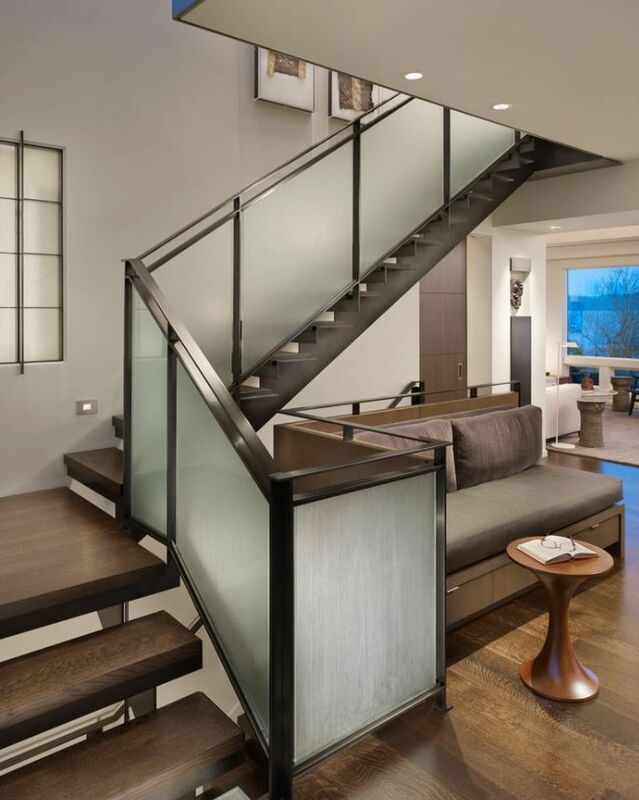 In keeping with the visual lightness of glass railings, this combination of frosted glass panels and dark brushed metal framing and handrails is a modern take of a more rustic home design. The glass panels inject the airiness needed to elevate this otherwise dark design and make the stairs fit in wonderfully with the open spaces and large windows of the room.